Standard-conforming protection of the heating system: filling, filtration, degassing, desludging. Professionals are required when it comes to safety. 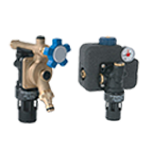 We from SYR have heating valves complying with all standards. 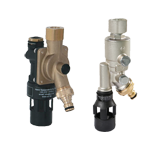 Starting with the DIN EN 1717 requirements for the potable water protection to prevent the pollution of the drinking water by backflow, backpressure or backsiphonage of the heating water and thus, avoiding health hazards. Up to the VDI 2035 standard aiming at preventing lime formation and water-induced corrosion causing expensive damage in heating systems. Should the manufacturers’ requirements for the fill water not be fulfilled, the warranty may no longer apply. Installers and operators have to see to it. And with SYR, you are on the safe side!